RapReviews.com Feature for November 2, 2010 - N*E*R*D's "Nothing"
Any short list of hip-hop's most influential producers over the last 15 years worth its salt would have to include Pharrell Williams. If that seems to be giving Chad Hugo the shaft, his creative partner in The Neptunes, you've gotten the right idea. Don't mistake this opening paragraph for an indictment of Hugo's work though, it's more about Hugo's fame as an artist. Pharrell is the one who puts himself out there in the spotlight, making solo albums and singing hooks for Snoop Dogg and Jay-Z. You could hardly be blamed for wondering what Hugo does when "Skateboard P" isn't around to collaborate with, and that's just talking about The Neptunes as producers. Once you get into their albums as rock/rap group N*E*R*D he's still a star compared to Shay Haley, who is accurately described as "providing backup vocals" and who hasn't done an interview anyone reading this review would even remember let alone care much about. 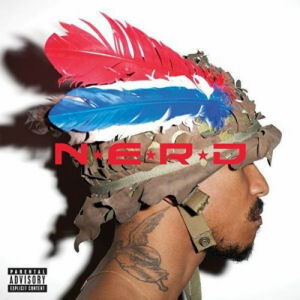 Chad at least stands out as the band's musician and architect of instrumentation among the trio, but let's be perfectly honest about the whole endeavor - N*E*R*D exists because Pharrell exists. Without him there would be no point to the group whatsoever. That is where the admittedly eclectic N*E*R*D hipsters both fail and succeed. Pharrell is so fascinating you could reflect sunlight off his head and mistake him for the moon in the night sky. He's unabashedly sincere even when singing the most simpleminded lyrics, and speaking of that singing, he has a falsetto croon that no real singer would mistake for "talent" that's still endearing to listen to. At various times Pharrell can remind you of any one of a dozen artists you like: Curtis Mayfield, Prince, Lenny Kravitz or Chris Brown. Does he come close to owning the muscle chords any of them do? HELL NO, but it's amazing how well Pharrell makes what he's got work despite his limitations. Part of it owes to a lack of pretentiousness. Mr. Williams doesn't cover up his shortcomings with vocal layering, AutoTune, guest crooners or mixing himself so far down only Chad's musical stylings and Shay's backup singing are heard. He puts himself out there for better or worse, and ends up the better for it, yet N*E*R*D often find they are not taken seriously artistically. Common complaints about Pharrell's lyrics include (but are not limited to) being overly simplistic, sexually crass, lacking profound insight and catering to a mindless partygoing generation. But all that can change, let's get loose tonight"
With the world on your shoulders, what can you see? Just clear your mind and, you'll feel like me"
I have no problem enjoying "Nothing" even if N*E*R*D is what one fellow RR writer coined as "inoffensive background music." There are so many musicians and rap artists out there today trying to be the best, the greatest, the most important and the most beloved that sometimes the most successful is the most inoffensive. What this trio achieves is a relaxed cool that seems deceptively effortless but is in fact carefully assembled and produced to achieve the maximum amount of mellow. If you're not looking for an album that will change the world, but simply change your mood for an hour or two, there's definitely something to be said for "Nothing."